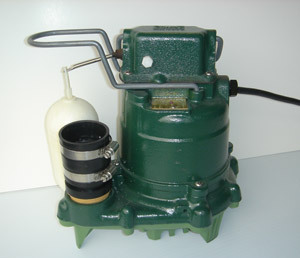 Zoeller submersible sump pumps (like the one shown) offer reliable, long-term performance. To feel confident that your basement will stay dry even in the wettest weather, you need a sump pump that delivers reliable performance day after day. That’s why it's a good idea for homeowners take the time to learn about the features that separate good sump pumps and sump pump systems from those that aren't so good. The sump pump plays a critical role in any basement or crawl space waterproofing system. Drain pipes installed around the foundation collect water and direct it to a pit, or sump, where a sump pump pushes the water away from the foundation through a discharge pipe. A float switch turns the sump pump on automatically. There are two main types of sump pumps: pedestal and submersible, and each have their pros and cons. In these videos, basement waterproofing expert and Basement Systems founder Larry Janesky compares several different sump pump models and explains the most important features to look for if you want a reliable, long-lasting sump pump. Learn about different types of exterior sump pump features, such as float switches and pump housings. Watch for an inside look at different sump pumps, comparing motor design, RPMs, heat dissipation characteristics, switches and impellers. Resistance to clogging: If a sump pump’s intake port clogs with silt or other debris, pumping action slows or stops. This allows the water level to rise while also stressing the pump motor. To avoid a clogged intake, it’s helpful for the sump pump to be housed in a durable plastic sump liner that can be inspected and cleaned more easily than an unlined sump pit. A lid for the sump liner will keep out debris that can cause clogging. Avoid sump pumps that have screened intakes, which can clog easily. Instead, the pump can be elevated on a platform at the bottom of the sump liner. It’s also important for the sump pump impeller to be designed so that small pebbles and other debris won’t be trapped by the impeller blades. All Basement Systems sump pumps come with these anti-clogging features. Powerful sump pump motor: A low-priced “economy” sump pump might have a motor rated at 1/6HP. Basement Systems only uses Zoeller sump pumps rated at 1/3HP or 1/2HP. A more powerful motor lasts longer because it doesn’t need to turn at high RPMs or operate for extended periods to pump a high volume of water. Lower power usually means shorter motor life. Cast iron motor housing: The plastic motor housings used on low-priced sump pumps don’t respond well to the heat that is generated during extended pumping sessions. When a plastic housing gets hot, it expands, creating excessive tolerances that can cause the motor’s bearings to burn out. Cast iron is better at dissipating heat and tolerating high heat without distorting. Float & switch design: All sump pump systems rely on float-type switches that turn on the pump when water rises to a certain level in the sump pit. A “ball-on-wire” float switch is more prone to malfunction than a column-type float switch. The float itself is another important feature. A hollow float will sink and cease to function if it is punctured. The Zoeller pumps used by Basement Systems feature a secure, column-type float valve and a solid float that will never sink. Battery backup: Storms that cause basement flooding can also cause power outages. When the electrical grid goes down, a standard sump pump won’t operate. That’s why Basement Systems offers sump pump systems that include battery backup. Basement Systems designs and installs sump pump systems, not just sump pumps. A sump pump system can contain more than one sump pump, and it probably should if you want full protection against power outages and extremely wet conditions. Our TripleSafe® sump pump contains three sump pumps: a primary pump to handle normal pumping volume, a secondary pump that comes on if the first pump stops working or can’t handle the volume, and a third pump that operates on battery power in the event of a power outage. A single sump pump could never provide this level of protection against a basement flood. If you have a wet basement or flooded basement, it's recommended that you invest in the best sump pump you can afford. Your local Basement Systems dealer will be able to recommend the best sump pump for your needs. Contact us today to schedule your in-home consultation and estimate!